On a late afternoon in Los Angeles' Chinatown district, four women are avidly chatting in a booth at the pharmacy-themed bar Apotheke LA. The venue's hiding-in-plain-sight, speakeasy vibe -- no signage advertises its location -- is a fitting backdrop for the conversation taking place among these veterans of the music industry -- OGs, if you will. 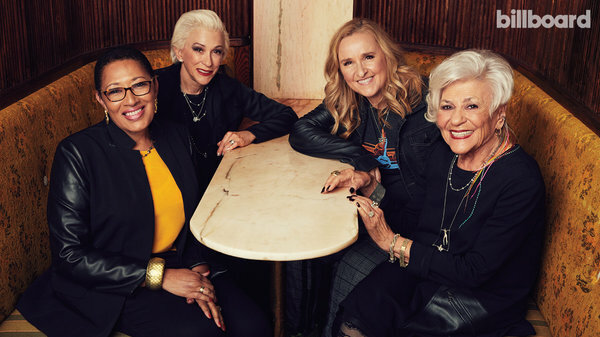 Over the past five decades, booking agent Marsha Vlasic, former live-industry executive Claire Rothman, marketing and event producer Pat Shields, and rocker Melissa Etheridge have carved out lasting careers, starting at a time when the few women breaking into the male-dominated business were hardly acknowledged, let alone celebrated in the ways they are today. The Grammy and Academy Award-winning singer-songwriter, 57, is best known for songs such as “Come to My Window.” Stepping into national prominence in 1988 with the single “Bring Me Some Water,” she gave a voice both to women in rock during a male-dominated time for the genre and to the LGBTQ community after she came out in 1993. Sami DrasinClaire Rothman photographed on Nov. 13, 2018 at Apotheke LA in Los Angeles. Retired industry grande dame Rothman, 90, held several executive posts at Ticketmaster, including executive vp. Prior to that, she served as GM and then president of The Forum in Inglewood, Calif. She now stays busy as a board member for City of Hope and other organizations. Currently a partner in Black Dot, a multimedia entertainment company offering services in marketing and event production, Shields helped promulgate black music during its first major renaissance in the 1970s and '80s. As vp marketing for Warner Bros. Records' black music division, she worked with Quincy Jones, Al Jarreau and Chaka Khan. She also held marketing posts with Atlantic and DreamWorks Records. Sami DrasinMarsha Vlasic photographed on Nov. 13, 2018 at Apotheke LA in Los Angeles. Brought together to share their perspectives as some of the first women to break the glass ceiling of music's boys club, Vlasic joked that some might interpret the term “OGs” as a euphemism for “old gals.” But make no mistake. These ladies' perspectives are as vital as ever. What prompted you to pursue a career in an industry that didn't exactly welcome women? VLASIC It wasn't a planned situation. I came from a very poor family and had to work after high school. My first job was for Frank Loesser, the playwright. From there I ran the office for some manager-producers who represented go-go girls. One of them was Goldie Hawn, before she left for Hollywood. [These guys] were crazy. They had a casting couch. Whatever you've heard, they did. I stayed there five or six years, then joined the American Talent International music agency, where I worked for three agents -- also insane. One of them was leaving to manage Deep Purple and [wanted me] to go with him as his assistant. The bosses said, “No, you can stay and become an agent.” I was the luckiest person on the planet. I didn't have music education. I still don't know a good guitar player from a bad one. With me, everything was done on instinct. ROTHMAN People of my generation really didn't plan their careers. Much like Marsha, I was a pencil pusher who was recruited by the Spectrum [arena] in Philadelphia, my hometown. It was the time when the National Hockey League expanded from six to 12 teams and a lot of new venues came up. The Spectrum was one. Two weeks after I took the job, it filed for bankruptcy. I was newly divorced, with one kid in college and one in high school. I thought, “Oh, God, what did I do?” But in five years, we brought the Spectrum out of bankruptcy. We paid 100 cents on the dollar, and I wrote out every check. We formed one of the first partnerships with Electric Factory Concerts. We provided the building, they provided the acts. SHIELDS I wanted to work in TV production. When I got out of college, I went to a station and was told that they didn't have anything, but there was a job at their radio station, WNEW-AM [in New York], which was playing Julius La Rosa and Shirley Bassey. I was a black girl fresh out of school. I didn't know who these people were, but I took the job. I started talking to promotion people as they came in and found out Atlantic was looking for a secretary. I said, “I went to college. I'm not going to be a secretary.” They said, “You better get your foot in the door.” [Atlantic vp black music] Henry Allen hired me to work for the national promotion director. ETHERIDGE I went through the '60s and '70s growing up in Leavenworth, Kan. After graduating from high school, I played in country bands around Kansas City, basically behind chicken wire. I started out singing TammyWynette's “Stand by Your Man,” but I wanted to be a self-contained artist. I went to Berklee College of Music for a few weeks, then began playing in a restaurant. I was able to make enough money to live [in Boston] for a couple of years. When I was 21, I moved to Los Angeles. This was 1982. I had visions of L.A. being Joni Mitchell, Neil Young, the Eagles. Then I got there and it was all hair and spandex. [Laughter.] So I started doing what I could. I ended up playing in women's bars before I was eventually signed to Island Records by Chris Blackwell. Sami Drasin“I am going to rock until I drop,” says Vlasic (far left), with Etheridge, Shields and Rothman.